Blue moon glows over Pittsburgh. We watched the receding sun cast it's golden shadows over the city as a rising blue moon ascended. 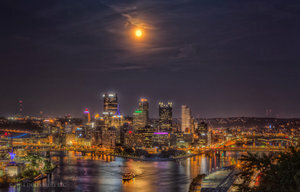 The moon's glow as the cities lights developed soon cast their luminance on the three rivers water surface filled with week-end boaters and the Gateway Clipper tour ship, which idled into the moon's glowing surface and drifted down the Ohio River head waters allowing their passengers to reflect on this special evening.